As smartphone users, we all love to have the best smartphone in our hands. Android users tend to have the latest flagship phones while iPhone users try hard to get the most updated iPhone as soon as possible. The rivalry between iPhone and Android is not new and it is going on since day one. There is no doubt that both technology giants have the best smartphones in their infantries. But for some models, we can say that we don’t need them. And Samsung Galaxy S7 Edge is one of those lucky or we should say unlucky handsets. There is no doubt that Samsung Galaxy S7 Edge is the choice of thousands of users regardless of its benefits and disadvantages. But since we are dealing with a high priced smartphone, here we have prepared for you the top reasons that why you should SELL your Samsung S7 Edge right away. If you are already using Samsung Galaxy S6 Edge Plus, then there is no need to upgrade. And if you are an existing user of S7 Edge then we recommend to sell it and upgrade to any other smartphone ASAP. By the way, before revealing the cons of Samsung Galaxy S7 Edge, let’s review its specifications. Now let’s discuss the reasons, the cons of Samsung Galaxy S7 Edge. 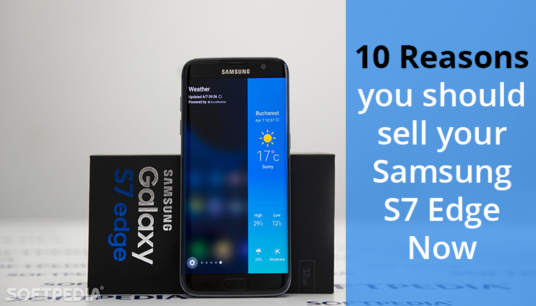 And we are sure that after reading this article, you will look for the places where you can sell your Samsung Galaxy S7 Edge. Samsung S7 Edge has a back glass fingerprint feature. And this feature is a disappointment. After buying this smartphone, you might be enjoying its design but whenever you use the back glass fingerprint, you surely get disappointed. Many users tested this thing and found the same results. Samsung S7 edge’s fingerprint catching is so bad that you have to carry a microfiber cloth all the time to clean it. Though the silver color model of S7 Edge is a lot shinier than the black version still the fingerprints are quite deceptive. 2. Still 32GB Memory Space Phone? Now is the era of new inventions and advancements. Technology giants like Apple offers memory space of up to 512GB in its iPhones. And on the other hand, Samsung offers 32GB of memory space in its S7 Edge. This is very low space compared to what iPhone offers. Many Samsung Galaxy S7 Edge users did complain about this issue. From personal stuff to e-books, we have a lot to save in our smartphone and with this low memory space, we cannot save our precious data in S7 Edge. So, the right solution to this problem is to sell Samsung S7 Edge and upgrade to S8 + or any other latest flagship phone. Sorry guys, Samsung Galaxy S7 Edge doesn’t provide Infra-Red Port. So, if you just installed a digital home appliance in your home and want to use it through IR blaster on your phone then you might have to sell your S7 Edge right now and upgrade to any other compatible phone. The list of cons continues. This time it is the front camera of the phone that failed to impress the audience. The front camera of the Samsung Galaxy S7 Edge is five megapixel. Though it is a good camera but in certain light conditions, it can make you look like a mannequin. Yes, you read it right. The result of the front camera of S7 Edge is a bit harsh. You will look a little unrealistic in your selfies. So if you are a selfie king or queen in your circle, then you should sell your S7 Edge smartphone otherwise your friends won’t be able to recognize you in your photos. It is a good habit of reading mystery books but what to do if you got mysterious lines on the screen of your Samsung S7 Edge. Due to the softness of the screen glass, S7 Edge easily gets colourful lines on its screen. A little pressure on the screen can ruin your video calling experience. Many S7 Edge users complained about this issue and as of now, there is no possible solution to these mysterious lines except selling the device. A lot of S7 Edge users notified another issue that sometimes their S7 Edge’s screens become unresponsive when their hands or palm quietly touch the edges of the smartphone. This could be a serious issue when you are chatting with your friend or reading your favourite novel. You can avoid such issue by holding your S7 Edge with either two hands or very lightly with one hand. This condition can become uncomfortable when you hold the phone so lightly. Another con to remember! Some Samsung fans might get amused when Samsung announced that its Galaxy S7 Edge would have Dual SIM option. But all of the happiness gone away when users experienced that the slot for second SIM card and the memory card are the same. You have to decide between having two SIM cards active at the same time, or just one SIM card with extra storage. Though the back and most of the front of S7 Edge is made up of Glass, but what about the edges of the phone? There is no such protection at the sides of the phone. So dropping the phone will result in very sad outcomes. Possible Solution? Sell your Samsung Galaxy S7 Edge. Though this con is not a big deal for most Android users but some people like to have the option of swapping out batteries when they like. So, if the battery gets damaged, you have no other option other than selling your S7 Edge. Last but not least. The price of Samsung S7 Edge is too high that it cannot be ignored. So if you are planning to upgrade to S7 Edge this Black Friday, then we suggest that you should think twice before making such a decision. I have made up my mind, where can I Sell Samsung S7 Edge? It is quite possible while reading the article you have prepared yourself to sell your S7 edge smartphone. And you must be wondering, where to sell it. Well, don’t go anywhere else. We have a solution to your problem. Sell your S7 Edge at SellTheMobile. Though S7 edge has a lot of disadvantages but you can still get benefit from it by selling at Sellthemobile. We have a bundle of deals for you. Just pick your desirable deal and sell your Samsung Galaxy S7 edge for maximum cash.